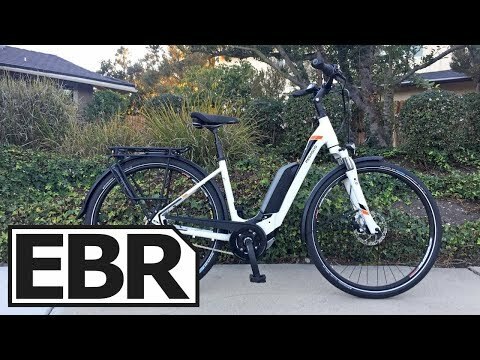 https://electricbikereview.com/pegasus/premio-sport/ The PEGASUS PREMIO SPORT is a relaxed urban electric bike complete with fenders and chain cover to keep you clean, available in four frame sizes and high-step, mid-step, or step-thru frame style, only available in gloss white for now. Comfortable upright geometry with adjustable angle stem, swept-back hybrid handlebar, premium ergonomic grips, a suspension fork, suspension seat post, and gel saddle with rubber bumpers. Efficient 700c tires are e-bike rated with puncture protection and reflective sidewall stripes, powerful hydraulic disc brakes provide ample stopping power and adjustable-reach levers, included frame lock is keyed to match the battery. Less expensive than the other 2019 PEGASUS models because it uses a chain vs. a belt and the externally mounted PowerPack 500 battery, still includes a great cargo rack with a mini pump and integrated lights for safety, efficient Bosch Active Line Plus motor is quiet and smooth.